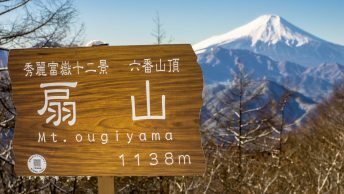 The Hinodeyamakita Ridge trail is not surprising absent from most hiking maps including Shobunsha’s Okutama 1:50,000 and the official government 1:25,000 topographic map series. The only evidence of its existence comes from the Okutama Nature Information Map published in 2008 where it is shown as a minor pathway. Visible at the start of the trail is a sign mounted courtesy of the Ome City Tourist Association stating: please don’t enter the mountain trail as it is dangerous. 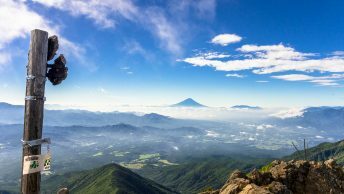 This has led to various conspiracy theories including suggestions of the Mitake Tozan Railway not wanting people hiking directly to the summit thereby bypassing their monopoly on ferrying passengers. 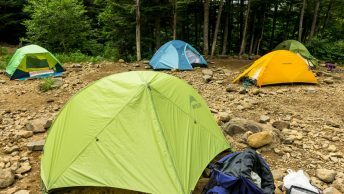 On further research it is likely the hike crosses private property leased by a landowner and the owner doesn’t want large crowds of day trippers trespassing which is fair enough. Another point is, while the hike is by no means dangerous the trail is rather rough and steep which is unusual for one so close to a popular tourist destination. So with a firm understanding of what I was up against and Golden Week weather turning on some of its finest I decided to take the plunge. Typical for this time of year is the ghastly numbers of hikers packed into the Okutama train carriages akin to commuter rush hour. Existing Mitake Station 御岳駅 most punters made a beeline to the nearby buses waiting to shuttle them to the cable car leaving only a couple of us making the journey on foot. The walk to the Kousenbashi Bridge 光仙橋 which marks the start of the trail takes around 20 minutes. Straddling the steep staircase whilst trying to evade detection brings you to the start of the Hinodeyamakita Ridge 日ノ出山北尾根. While the route is devoid of the usual signposts it is actually well marked with tape wrapped around trees and a series of numbered red markers tacked close to the ground. The walk from Mitake Station to the summit of Mt. Hinodeyama 日の出山 (902 m) takes around two hours. There are couple of prominent rest stops including one marked on the map as 露岩 exposed rocks. About half way up there are some fine views offered to the north overlooking the Mitake Township. During the final ascent the trail dips into a saddle where the summit viewing platform at last comes into view. Arriving at Mt. Hinodeyama unscathed I was greeted with an overwhelming number of fellow hikers who had no doubt arrived by less devious means. The view by mid-morning was becoming somewhat hazy though the spring flowers including some late blooming cherry blossoms livened the backdrop. Perusing the map I decided the best route back to civilization was via Mt. Mitsumuroyama 三室山 (646 m) and the small Kotohirajina Shrine 琴平神社 onwards towards Hinatawada Station 日向和田駅. The trail back in comparison was like a highway firmly trodden into the landscape. I quickly lost count of number of hikers I passed in both directions distracted by the incessant clamour resonating from bear bells – the joys of Golden Week hiking. Surprisingly I also met a fair number of mountain bikers who had somehow managed to crawl a passage through the masses. The last section of trail twists through a shaded valley before finally coming to an abrupt end where it meets the bitumen. From here follow the road through the village making a left turn at the first set of traffic lights and a right at the next. The railway station is located another 700 meters across the Tama River to your right.